Milan 2014: a series of talks will launch this afternoon in Nike's Aero-static dome at Palazzo Clerici, forming part of the FOMO algorithmic publishing project organised by Joseph Grima with Dezeen. Three afternoons of talks called On The Fly will kick off today with Clemens Weisshaar, Atelier Bow Wow, Folder, Linda Fregni and Bart Hess discussing the theme of weightlessness in design. 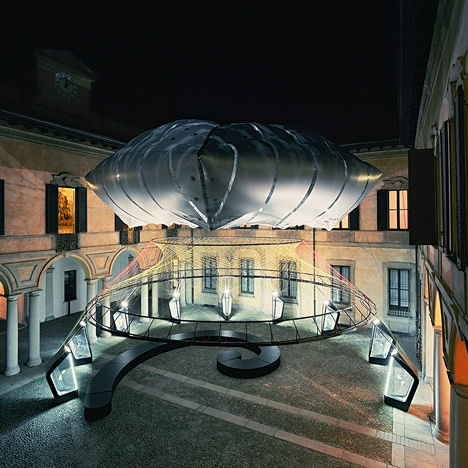 The talks will take place at Palazzo Clerici inside a dome created by Arthur Huang, founder of MINIWIZ, which uses Nike's Flyknit technology to create a temporary events space. During the talks a real-time publishing algorithm – developed by Joseph Grima's design research group Space Caviar and called Fear of Missing Out (FOMO) – will automatically create written articles from live speech and social media streams using the #OnTheFlyMilan hashtag. These will be collated in a PDF that will then be printed and saddle-stitched on the spot from the FOMObile – a roving publishing press with its own built-in power generator and solar-powered wi-fi hotspot. The resulting publication will be distributed for free in Milan and made available on the Dezeen website. The On The Fly talks will be FOMO's first test in a real-world environment. Anyone, anywhere will be able to take part by using the #OnTheFlyMilan hashtag on social media on Wednesday 9, Thursday 10, and Friday 11 April between 5.00 and 7.30pm CET. Today's event will be moderated by Joseph Grima, founder of Space Caviar and the former editor of Domus. Talks on Thursday will be hosted by Gianluigi Ricuperati and will include Ianthe Roach, Pier Nucleo and Italo Rota, who will all discuss the theme "seamlessness". On Friday, Marco Velardi will host Formafantasma, Martino Gamper and Anna Meroni talking about sustainability in design. Weightlessness will explore how external masses and strains, or lack thereof, shape the thinking and production of design. How does the experience of our environments impact on the design process? What does this mean for the final product? With a shifting landscape of outside forces, what does this mean for practice? What would freedom, or weightlessness, from this mean for our work and for us? Seamlessness will ask whether consistency is good for design. Is a process, or product, designed without interruption a good thing? Is a perfectly consistent object or idea something positive? What can the messy convergence or merging of technologies, processes or people add to a project? How do these transitions and interfaces of design change or challenge us for the better? Sustainability will take the practice of contemporary practitioners and explore the social, political, economic, and environmental aspects of sustainability. What is the impact of designing sustainably? How do we sustain interdependence between process, products and disciplines? These conversations will attempt to understand the life cycle of design, and the flows of work systems.